Stained and Leaded Glass Master Craftsmen, Conservators and Artists. Rohlf’s Stained and Leaded Glass Studio was established over 95 years ago and has been creating and conserving stained glass art worldwide. It is with pride that we can say that our stained glass studio has excelled and achieved the highest standard of excellence through three generations of family members. Peter A. Rohlf, CEO (center) with his two sons. Rohlf’s Studio has been owned & operated by 3 generations of family members for over 95 years. Back in 1981, Rohlf’s Studio acquired the George L. Payne Stained Glass Studio of Paterson, NJ, which was established in 1896, making our combined history one of the oldest stained glass establishments in the United States. It is with dedication to our craft that we can offer our clientele the knowledge that we have acquired from the past and our present experiences, which have enabled us to progress. We have been fortunate to have been chosen to conserve some of the most prestigious cathedrals, religious edifices and institutions in the United States and around the world. Our Studio’s facility has over 15,000 square feet along with our 25 Craftspeople, artists and office personnel to oversee the day to day operations. Areas of the studio include Cad and printing, layout, art room, full scale copying equipment, 8′ x 16′ selecting bench with North Light, three (3) painting areas, five (5) kilns, twelve (12) work benches and separate waterproofing facilities. There is also a Restoration area for photography, rubbings, wet room and stripping.The Studio is powered with Solar energy. Rohlf’s Studio has also been privileged to work alongside some of the most gifted artists, artisans and conservators ever associated with our craft. One such individual was Frederick Cole who was knighted by The Queen of England for undertaking the restoration of Canterbury Cathedral as artist in residence and one of the most recognized and revered stained glass designers. Mr. Cole was the lead stained glass designer for Rohlf’s Studio for over 13 years. Peter A. Rohlf, CEO, was honored to have gone through the stained glass restoration work shop at Canterbury to further his knowledge of the procedures of conservation and restoration of stained glass. 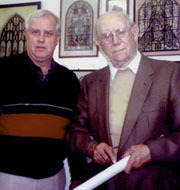 In 2003, Peter A. Rohlf was awarded the Lifetime Achievement Award from the Stained Glass Association of America “In recognition of his dedication to preserving the heritage of a family studio, his commitment to honest and fair business practices and his respect and support for stained glass artists and craftsmen around the world”. Our reputation, integrity and longevity allow us to accept the challenge of providing the artistic requirements and preservation expertise to secure your confidence. We apply our professional knowledge to compliment the architecture, to beautify and to conserve your edifice. We are dedicated to the principals and traditions of Old World craftsmanship and endeavor to attain the highest quality of our craft. The history of Rohlf’s Stained & Leaded Glass Studio spans more than 95 years and three generations of Rohlf’s. In 1934 Hans H. Rohlf purchased the Stained Glass firm of Emil Teitz from his estate; the firm was originally founded in 1920. Rohlf’s Stained & Leaded Glass Studio, in the early years, provided large amounts of zinc, beveled and turn-of-the century Stained & Leaded Glass windows. In our later years, Rohlf’s Stained & Leaded Glass Studio expanded into religious and secular buildings in both new stained & leaded glass window designs, as well as stained & leaded glass restoration. 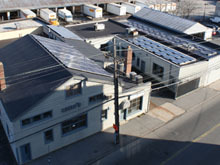 Today, Rohlf’s Studio is one of the largest stained glass window firms of its kind, having completed major window installations at Yale University, City College – NY, St. Paul’s national historic landmark, St. Patrick’s Cathedral, and literally thousands of commissions worldwide involving stained & leaded glass windows. Our expertise provides architects, contractors, institutions, homeowners and the religious community with a professional and reliable staff of artisans to guide you through any of your Stained & Leaded Glass window projects..
Providing diversity in Stained Glass Art and preserving America’s heritage through Historic Restoration and Preservation of Stained and Leaded Glass for more than 95 years. Kindly browse our web pages and our Stained Glass photo galleries for more information.